Does anyone knows how to integrate indicators (sensors and kpi) of different process in to one dashboard and report? It means, include in onde dashboard and in one report indicator of different process of the same customer. Customer decided to split a large process in to 4 different process to reduce complexity of implementation and improvements... but now, They need to have the indicators and reports of these process in to one DashBoard and Report. Is it possible in Studio version 10.7 ? Bizagi provides a comprehensive set of reports to monitor your business operation in real time showing which Tasks or Processes are on time, overdue or at risk. (The term “at risk” means that the cases will expire within a period equal or less than the defined in theRisk signal property of processes. By default the risk signal is 24 hours). Through this feature you can anticipate or identify problems, reassign work and manage risk in order to meet your performance goals. Bizagi also allows for performance monitoring of historical information. These indicators enable Process owners and business managers to gain insight into business operations: bottlenecks, resource performance, service levels and trends. Each of these categories forms the basis for a more detailed identification of opportunities to improve Process performance. You can drill down to a specific case within any of the reports to view its flow path, the participants, among other things. Bizagi's Report tools are accessed in the Report menu of the Work Portal. 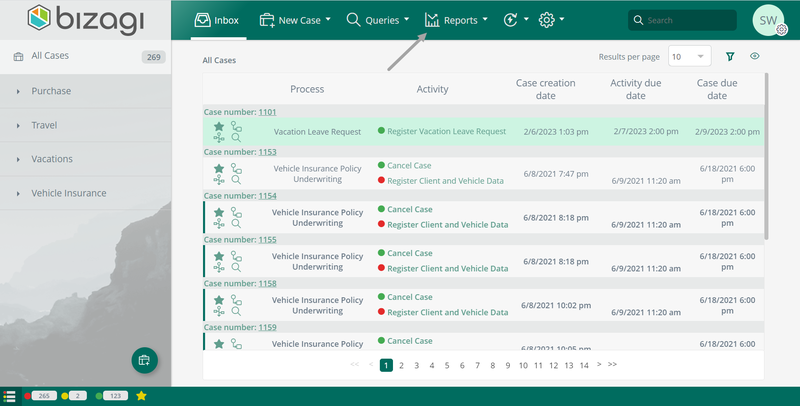 BAM: Business Activity Monitoring provides graphical information about the status of pending cases and Tasks classified by Process. Analytics: Provides graphical information about Processes performance based on closed cases. Sensors: Allows extracting information of the user defined sensors in the Process. These sensors comprise of Counters andStopwatches. My Reports: Allows access to Reports saved by a user. Thanks Juan, but your answer does not respond to my question ! As per Bizagi documentation, Managers of the process, will have to access the dashboards, reports individually (process by process)... it does not respond to the question ! Maybe I was not clear in my question ! Pls let me know ! !